I sat in my office recently talking to a couple of twenty-something guys about life insurance. Neither of them were dads, but I noticed one was staring at the hand-painted artwork of my daughter Maddie, that rests proudly at the front of my desk. Insurance talk came to a brief halt, “That’s about the neatest thing I’ve ever seen”. I quickly answered that it was my most prized possession, a Father’s Day gift. It’s taken me a few days to understand why I hold it so dear. Other than the obvious reasons, I thinks it’s this; it shows that for our shared experiences, her perception matches mine. The spirit of her memories is perfectly in line with mine in her artwork. In a wild life of hectic schedules, we found quiet times together. She always knew where her dad was. She always had someone to lean on. I don’t think I’m a hoarder, but I do tend to intercept a lot of thing that are bound for the garbage or the yard sale. Maybe it’s just a matter of awareness of the value of looking ahead because I know the treasure that lies in looking back. Possessions that have no monetary value become treasures for those who can look back together at shared experiences of earlier times. Often a single object does the trick. It’s become a Thanksgiving tradition for my brother, sister, and I to rummage through our dad’s basement and attic for worthless things that bring back priceless memories. A Happy Days board game. A slew of ticket stubs from concerts or sporting events. A little league baseball hat and a 40 year-old baseball glove. Treasures that remind me how thankful I am for my family and for childhood memories. In a home with four children, sometimes the purges are great. It seems that you can fill a 32-gallon garbage bag with Happy Meal toys at least twice a year. 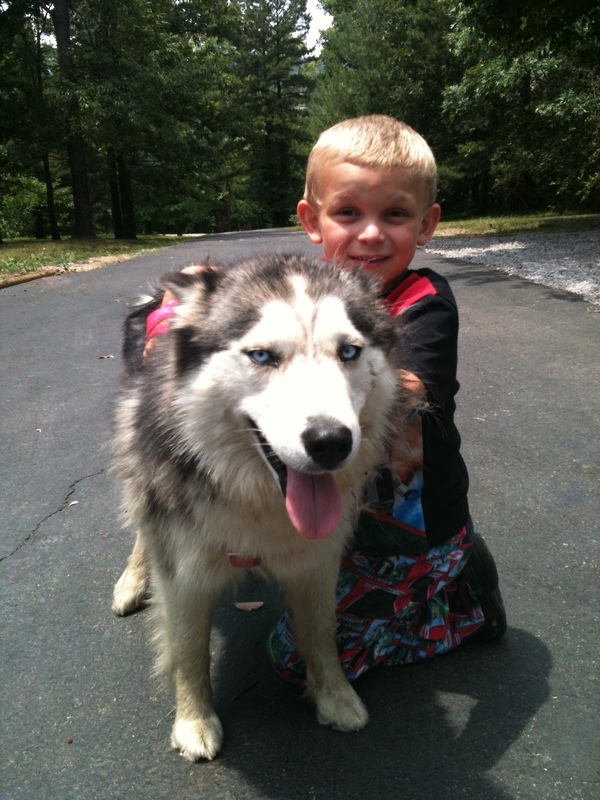 Sometimes items go away that parents wish they’d kept…….or someday they will wish they kept them. There was a coat that both of our girls had worn as toddlers that I spent a few years thinking had gotten away from us. I had a silent celebration when I discovered the Pooh coat buried in the bottom of a storage tub. “Get your Pooh coat on sis”. It has meaning for me now. Someday it may have meaning for the girls as well. Maybe they’ll dig it out together some Thanksgiving after dinner…….as adults……after they’re married. And they’ll give thanks for the childhood they spent together. And I’ll give thanks once again for the time I spent being the daddy of two little girls. They’re not so little any more. Macy is a college graduate, living 4 hours away, and getting married in September. Maddie just completed her first year of college, but is thankfully home to spend the summer with us (as much as a college student spends the summer with their parents). The start date of her summer job was pushed back for a week, so she decided to have a yard sale last week. Mostly things that belonged to her and Macy. I showed up to help her set things up early on a Saturday morning. As I was digging through the tubs and boxes, placing items strategically so they could be seen, I hesitated when I pulled out a pair of well-worn soccer shoes with a $.50 price tag on them. Maddie probably didn’t know why. They were her sister’s shoe’s. I didn’t know myself. Macy had put together a pretty successful soccer career. A player on our school’s first regional championship team to go along with some notable individual accomplishments. Two years of soccer in college. But I honestly couldn’t even begin to remember what season she wore them in. And she may not remember herself. But I remember well the night she picked them out. And as the days count down to her wedding day, I wonder if she remembers too. For a dad that really knew little about soccer (other than learning just enough to be a youth soccer coach) and little about soccer shoes, I placed myself firmly in the middle of the annual soccer shoe buying process. Our girls generally wore their shoes out by playing in both the fall and spring. Sometimes I had to insist that they replace worn out shoes. “Daddy, I think these will be alright”. So the tradition became that dad combed the internet for shoes that were acceptable for his girls to play in each season. Time after time, I’d call one of them to the arm of my recliner, “What do you think about these, sis?”. As they got older, they came to my recliner, iPad in hand, “Dad, what do you think about these?”. And the dad who hated to overspend on fancy things or pay too much for shoes or clothes that would soon be outgrown always made an exception when it came to soccer shoes. I don’t think the girls really grasped just how little I understood the game of soccer. But I think they did come to understand that their dad thought it was important for his girls to play in quality shoes. “Are you sure those are the ones you want, sis?”. So I’ll store the shoes away in a tub with other treasures. Other memories. Someday they’ll come back out. Maybe on a Thanksgiving afternoon, Macy will dig them out with her brothers and sister. And maybe she’ll tell her own kids that she was a pretty fair soccer player in her day. And it may not be worth mentioning to her kids, but I have a feeling that she, and her sister too, will have fond memories of picking out soccer shoes with their dad. I’m glad I saved the shoes. But they’re just shoes. The real treasure lies in shared memories. And sometimes saving an item here and there helps to keep precious memories alive. And somewhere in my house is a Thomas the Tank engine wooden roundhouse that would fetch about $50 on eBay. I was thinking about selling it. But both of our boys spent hours playing with it. I guess I’ll hang on to that too. Walking through a shopping mall today with my two boys, I just stopped in my tracks and peered into a Claire’s store. After staring into the haven of trinkets for young girls for just a few seconds, I sped ahead to catch up with the boys. Macy and Maddie are 18 & 20 now. Maddie is away at college five hours to the northeast. Her sister is four hours to the south, graduating from college in April and preparing for a wedding in September. But in those few seconds in front of Claire’s, I was taken back in time. Following two little bright-eyed girls around the displays, patiently waiting while they chose their treasures of the day. Bracelets, earrings, Hello Kitty wallets, wooden jewelry bins covered in butterflies. Somewhere in another part of the mall, their mother would have been searching for a new Power Rangers action figure for an energetic and excited little brother. Somehow, quite a few Power Rangers action figures have survived the passage of time and remain stored in assorted bins around our home. I’m sure that few items remain from the trips to Claire’s. Simple memories stick around though. Kal is 11 and the family movie critic. He loved it and his 17 year-old brother did too. Their mother even loved it. But for me it was more than a movie. It was a trip down memory lane. Jumping up to run around the room to loudly sing the Power Rangers Dino Thunder theme song to the dismay of my whole family. Driving around the state for our girls travel soccer games with a flip down TV monitor displaying a Power Rangers marathon for all in the back seats (the girls wouldn’t admit it, but they couldn’t help watching too). So tonight, stuck in a strange mood, and missing our girls, I’m just thankful for happy memories of little things. Thankful that I have memories that make me smile instead of regrets that bring sorrow. For parents, when the time comes when our kids are no longer under our roofs, some things just seem to come into clearer view. What we did well. Where we came up short. I won’t talk about what an amazing mother my wife is, because that’s just a foregone conclusion. But I will share some truth about little things that dads can do to have an amazing impact on the lives of their children. Be physically present. Our kids should never entertain the idea that they are less important than our jobs, our golf game, our fishing trips, or our workout schedule. Don’t underestimate the value (when schedules allow it) of being there when they wake up or go to bed, along with the value of attending as many school functions, recitals, and sporting events as possible. Be mentally present. Look your kids in the eye when they speak and listen as if it’s the most important thing that’s ever been spoken. Get your nose out of your smartphone or laptop and interact with your kids. You only get one chance to raise your kids, don’t miss it (no regrets). Be emotionally present. Most of the time, guys aren’t exactly gifted in the area of saying the right thing (especially when our daughters become teenagers). But thankfully, frequent hugs and pats on the shoulder are a valuable and acceptable substitute. Choose your words wisely. Kids are guided less by the instructions that we give them than they are by the manner in which we speak to and about others. The way we speak to and about their mother (even if she’s not your wife) is so vital. 5. Make memories. Doesn’t have to be an expensive trip or adventure. It just has to be a shared experience. Shared experiences build relationships. Kids need good relationships with their dads. Watch a ballgame. Go grocery shopping. Go fishing. Play video games or board games. Read books to your little ones. No, I’m not wondering if we have too many guns or what our government can do to swing things in the other direction. I’m wondering how many of these shooters spent time in Claire’s with their dad and how many of their dads can name more than one Power Rangers series (Dino Thunder was my favorite). Probably not too many. I’ll bet you can change the world! There’s no time like the present to be fully present in the lives of those we love. I saw a post on Facebook recently, an article link about “what men really think about.” After reading it, I realized that most of the normal “man thoughts” didn’t really describe me. My mind was consumed by one thing, logistics. I think my wife could possibly have an overload of logistical thoughts as well. There is a silent danger in busy lifestyles to have our present thoughts consumed by thoughts of “what’s next”. Who needs to be where at what time? How will I get everything done? How will I deal with ____ problem tomorrow? How will I fix problems at work? How will I carve out future time with my family? How will we pay for college (for 4)? In what areas do my kids need guidance or redirection? You get the picture. The mind is distracted from the present. Compound this with the tendency to have over-filled schedules, running quickly from place to place, event to event, and you eventually risk living a life that lacks depth. Healthy interactions are replaced by an urgency to maintain schedules and show up on time. Eventually, we miss too much of the present because we are distracted by an unhealthy urgency to maintain what’s next. I’m not suggesting that we live safe, idle lives out of fear of overload. We should always be willing to consider doing more than we consider ourselves capable of doing, for the purpose of developing faith in God, and a reliance on His strength and not our own. But just because we can do something, doesn’t mean we should do it. Recognize when life becomes too much and too fast. Our level of distraction when interacting with loved ones is a good measure of this. When I got out of bed for church on Sunday morning, Kal was nowhere to be found in the house. He was already outside playing with his dogs. By the time he came in and got dressed for church and got his breakfast, we were nearing the point of running late for church. Being late isn’t a big deal to me, but since I had a class to teach, I at least wanted to not be late late. His mother and sister had already left, but I realized his big brother was still in bed. But just as I started to go roust big brother from his slumber, Kal launched excitedly into a tale of something his puppy Zelda had done earlier in the morning. I wasn’t the least bit interested in hearing this story. And we really needed to get moving to get to church on time. But there was a gentle nudge inside me as I looked down and saw the excitement on his face as he talked…….just as I was ready to tell him to tell me later because “we gotta go”. This is Important to him. Today and forever…….to have his dad’s full attention and to place value on his words. “Look him in the eyes and listen to every word he says, like it is the most important thing you will hear all day”. This is the thought that crashed into my brain. So I listened. And I’m sure that those two minutes that I almost lost because I was RUSHING to be somewhere on time, represented the most valuable two minutes of my whole day. Simply being present in the present. Getting something right that I’ve gotten wrong hundreds of times before. If it’s important enough for our kids to talk to us about (or ask questions about), then it’s important enough for parents to give full attention to and provide answers. Distracted parenting means we aren’t watching or listening like we should. Value the words of your children. Be attentive enough to see opportunities for praise and encouragement (and correction if necessary). When parents stop listening, kids stop talking. When kids stop talking, parents lose a big part of their ability to have a continued positive impact in the lives of their growing children. Plan ahead but don’t let your thoughts stay in the future. Live a full life, but don’t let your schedules dictate your life. And perhaps most importantly, it may be time to make changes in your life when your level of distraction and overload causes you to miss the little moments in the days of your children…………that become collectively huge moments when you miss them. If we expect our children to become adults who work hard when nobody is watching, it’s important to take time when they are children, to notice when they are working hard and doing their best. I spent some time Friday night watching my nine year-old son Kal participating in the Center Shot archery program at our church. It’s his second year in the program, but he has no other archery experience. More potential than skill. What he knows about archery, he has learned through this program (his dad knows zilch). I always watch him shoot at the target, but sometimes two kids are shooting at the same target. I can’t always tell which arrows are his from a distance. So I usually just watch his body language and facial expressions and see how closely he’s listening to instructions. Sometimes he looks my way in the back of the church gym during the night, but usually not. I wasn’t paying particularly close attention at one point because he had just finished shooting all of his arrows into the target. I might have even been distracted by casual conversation with someone seated next to me. But I looked up just in time to see Kal, looking back at me proudly. He was pulling his arrows out of the target, but he was saving the best for last. His hand waited on the arrow that stuck perfectly in the middle of the target. Kal wasn’t going to pull it out until he was sure his dad had seen it (“look Dad, I did it”). As soon as we made eye contact and I gave him a thumbs up, he pulled it out and went about his business. I didn’t carry out any notable “dad feat”. I just sat in a folding chair. But it made me think of kids that hit a bullseye and turn around looking for encouragement or approval…….and nobody’s there, time after time. 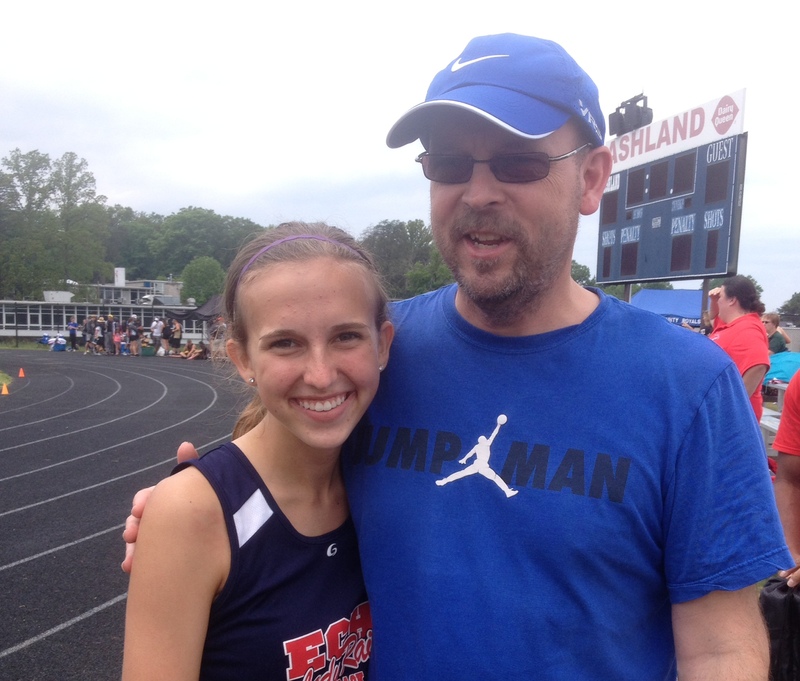 Today I watched my daughter Maddie run in her regional track meet. The 800M run is her top event and her best chance to advance to the state meet for the first time (1st & 2nd place qualify). She came into the meet as the 5th seed in region (I think?). 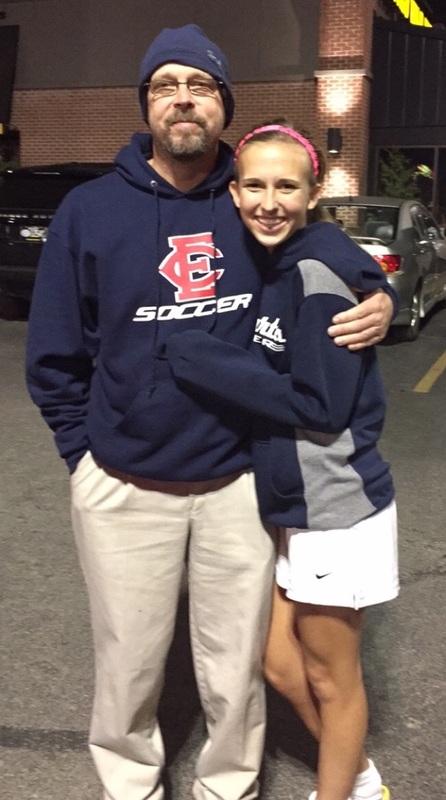 As a 16 year-old junior, Maddie and I have shared hundreds and hundreds of athletic contests, many of those with me as her coach at youth and middle school levels. But in high school, I have tried to be a quiet presence of support, hiding in the shadows. As a father of a teenage girl, the thought enters your mind that your daughter probably won’t even notice anymore if you’re not at her events (and does she even care if you come?). When Maddie was on the track today, I had no reason to believe she even knew where I was. I stood by myself at a spot just outside the track, about 75 yards beyond the finish line. She looked strong as she passed me on the 2nd and final lap. She moved up from 5th place to a strong 2nd place finish on the lap, finishing 5 seconds better than her season’s best time. Silently from a distance I watched. I wondered if she would look my way. I delighted in the joy in her face, felt a sense of pride in her laughter and sportsmanship among the other runners. And then she shocked me. Maddie looked across the track at me like she knew exactly where I was the whole time……grinning at me from ear to ear giving me a big thumbs up (“I did it Dad!!!”). I know it sounds cliche’ and cheesy but don’t underestimate the value of just being there. Kids just want to be noticed when they do something good. They need encouragement to continue on when they think they’re doing poorly. As our kids grow older, will our kids choose us as parents to share their triumphs with? Will they give up on something too soon because we weren’t there to help them believe in themselves? 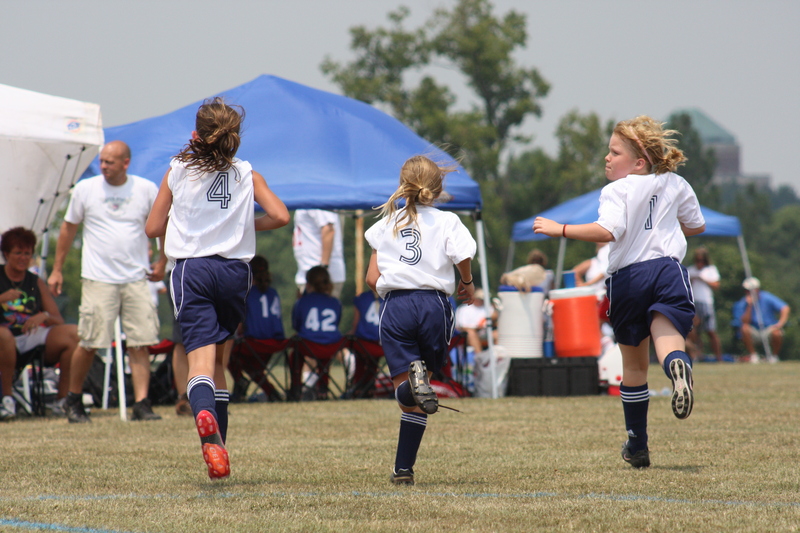 Some kids feel constant pressure to be the best on the court, track, or field. Kids that are playing to please somebody else are miserable. But kids that look over their shoulder for support, encouragement, and direction…….and always find it, are something else entirely. Whatever your kids are doing, just find a way to be there. They don’t need you to be there to tell them how they can do it better. They just need you to celebrate when they do it well (or give a a great effort, of course).